Myositis is a rare condition that affects the muscles. The term myositis means "inflammation of the muscles". The main signs are muscle weakness, painful or aching muscles, tripping or falling, and extreme tiredness after walking or standing. If you have any of these symptoms you should see your GP. Myositis is usually caused by an underlying problem with the immune system, where it mistakenly attacks healthy tissue. The UK-based charity, Myositis UK, has more information about the different types of myositis. See below for more detailed information about polymyositis and dermatomyositis, the two most common types of myositis. Polymyositis affects many different muscles, particularly around the neck, shoulders, back, hips and thighs. The muscle weakness may vary from week to week or month to month, although it tends to steadily get worse without treatment. You may find it difficult to get up from a chair, climb stairs, lift objects, and comb your hair. The muscle weakness can become so severe that even picking up a cup of tea can be difficult. If your neck muscles are affected, you may find it hard to hold your head up. If your throat or chest muscles are affected, you may also have breathing and swallowing difficulties. Dermatomyositis also affects the muscles and the symptoms are similar to those of polymyositis. But in addition there's also a distinctive rash. 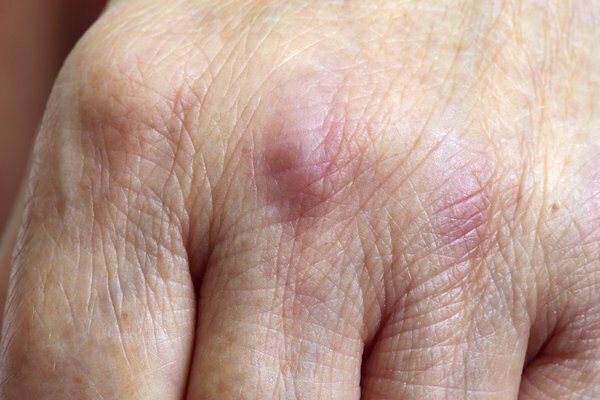 The rash can be itchy or painful, and you may also get hard lumps of tissue under the skin called calcinosis. Your GP will ask you about your symptoms and examine you. If they think you may have myositis, you’ll need to have some tests to help rule out other conditions with similar symptoms. You must be very careful about exercising if you have severe symptoms of myositis, such as severe muscle pain and weakness. Most specialists don't recommend exercising during this period. However, it's very important to maintain gentle muscle and joint movement, particularly in cases where myositis develops during childhood. This ensures that the joints which are moved by muscles don't become stiff and take on a fixed position. As the condition is brought under control, a gentle exercise programme can be started and gradually increased following the advice of a physiotherapist. High doses of steroids can cause side effects such as weight gain, high blood pressure, diabetes, cataracts (cloudy patches in the lens of the eye) and osteoporosis (weakened bones). Read more about the side effects of steroid medication. If the inflammation in your muscles flares up, your doctor may prescribe a disease-modifying anti-rheumatic drug (DMARD). DMARDs, such as azathioprine, methotrexate, cyclophosphamide or mycophenolate suppress your immune system and help reduce inflammation. These medications are slow to act, but in the long term may allow the dose of steroids to be reduced, along with their side effects. Intravenous immunoglobulin therapy may be needed in very severe cases of myositis where severe muscle weakness is causing life-threatening breathing or swallowing problems. It involves having an injection of normal antibodies from donated blood. This temporarily changes the way your immune system operates. Intravenous immunoglobulin therapy can produce a rapid improvement in the symptoms of myositis, but it's very expensive and the benefits usually only last a few weeks. Therefore, it isn't suitable as a long-term treatment, and is usually only used to treat people who are seriously ill while they're waiting for other treatments to work. It's thought that biologic therapies, which are widely used to treat conditions such as rheumatoid arthritis and psoriatic arthritis, may also play a part in managing myositis in people whose symptoms don't respond to conventional steroids and immunosuppressive medication. For example, rituximab is a biological medicine which helps reduce inflammation that's recently been approved for treating myositis. It's given by intravenous infusion (directly into a vein through an intravenous line, needle or catheter) on two occasions two weeks apart and may be repeated months or years later. Most people with myositis respond to a combination of steroid and immunosuppressive therapy, alongside carefully-controlled exercise. Steroids are often needed, in very low doses, for several years as well as immunosuppressive medication. This can lead to an increased risk of infection which in most cases can be easily managed with antibiotics if it becomes a problem. Some people with myositis respond less well to treatment and find the condition significantly affects their everyday activities and quality of life. But continuing to exercise usually helps improve muscle strength. If you have severe myositis, you may develop breathing and swallowing problems. Speech and language therapy may be recommended if you're having problems swallowing or it's affecting your ability to communicate. In rare cases, myositis can be associated with cancer, and you may be offered tests to check for cancer. Myositis UK provides further information, help and support for people who are diagnosed with myositis and their families. The Myositis Association (of America) also provides information about polymyositis and dermatomyositis.